Getting to the Department of Social Anthropology. Take the red line northbound from T-Centralen towards Mörby centrum. Get off at the station called Universitetet. At the exit you will find a map to help you locate Södra huset (the walk takes less than five minutes). Enter building B and take the lift to the sixth floor. How to plan your journey with SL and buy your ticket. Take bus number 50 northbound (destination Lektorsstigen/Stora Lappkärrsberget). Get off at Universitetet södra. You will find Södra huset on the same side of the main road as the bus stop (approximately two minutes’ walk from the bus stop). Enter building B and take the lift to the sixth floor. 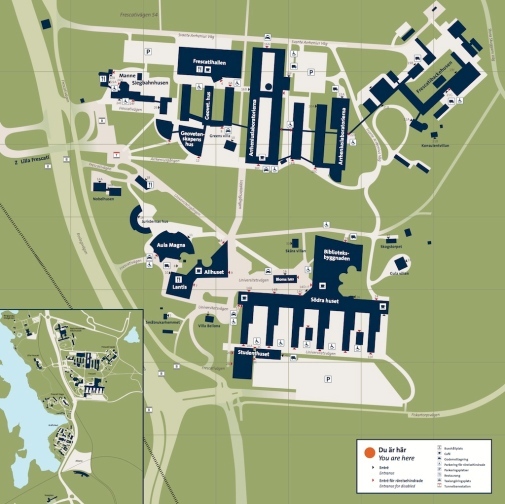 The address is Stockholm University, Södra huset, Universitetsvägen 10B. Ask the driver to stop at the turning place near building A. Then enter the building. You will find yourself on the third floor, walk along the corridor until you reach building B and turn right for the lift to the sixth floor. Take Roslagsvägen (E18) northbound from Roslagstull. Turn right at Universitetet, you will see a Statoil petrol station on the right hand side of the road (shortly after Albano). Drive straight ahead to the parking lot behind Södra huset (six identical, light blue buildings). Enter building B. You are now on the second floor, take the lift to the sixth floor. Try to make sure that the person(s) you want to meet will be at the Department before you visit campus, as staff members tend to be mobile and have varying daily routines. Between early June and late August, Swedish universities are usually closed and faculty members are often out of town during this period.